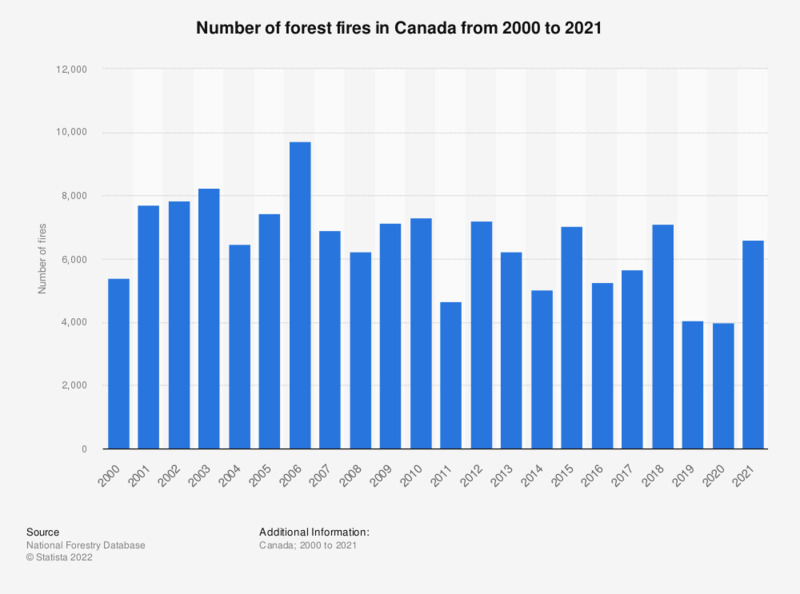 This statistic shows the number of forest fires in Canada from 2000 to 2016. There were 5,203 forest fires in Canada in 2016. Forest fires in Canada have burned an average of 2.2 million hectares annually since 2000. Forest fires or wildfires are named so because they occur in areas as woodlands, grasslands and scrublands. They are not confined to remote forest areas and can cause extensive property damage and threaten the lives of people who live in transitional areas between regions of human habitation and wilderness. Since 2000, forest fires have caused an estimated 3.3 million Canadian dollars annually. The recent major forest fire which began in Fort McMurray, Alberta is likely to be the most economically damaging disaster in Canada’s history, according to insurers. The fires have affected Alberta’s oil sands operations which have a significant impact on Canada’s GDP. The Fort McMurray fire, like many forest fires is suspected to have been caused by human activities. Fires started by human can be intentional, in the case of arson, or accidental, such as failing to fully extinguish a camp fire or cigarette. The most common natural cause of forest fires is lightning strike, which accounted for 2,370 fires in 2014. All told, Canada experiences on average 7,000 forest fires each year.